One way to examine the integrity of the data you burn into a CD or a file downloaded from the internet is via checking and verifying the existing checksum and the stored one. A checksum or hash sum is a fixed-size datum computed from an arbitrary block of digital data which can be used to detect accidental errors that might happen during data transmission or storage. By comparing the original checksum with the transmitted or stored one, users can verify whether the original data has been altered. To ensure and verify the integrity of the data files downloaded or transferred, users can try checksum managers or verifying tools to calculate and check the checksums. Marxio File Checksum Verifier is a free checksum calculator and verifier which allows users to calculate and verify checksums and compare them with the original. 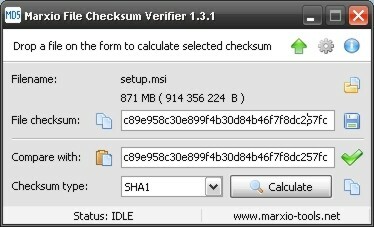 Marxio File Checksum Verifier is a portable file which can store and execute it from any portable device. It is user-friendly and features a simple interface. To calculate a checksum for a file, users just have to drag the file from Windows Explorer and drop it to the verifier to do the calculation. This application works well in Windows OS and most importantly it supports most of the major checksum types such as CRC32, MD4, MD5, SHA1, SHA-256, SHA-384, SHA-512, RIPEMD-128, RIPEMD-160, HAVAL 256 and TIGER 192. Download Portable Marxio File Checksum Verifier.